10 Weeks Until Microsoft Retires Windows XP Support based on customer feedback to have more transparency and predictability of support for Microsoft products. As per this policy, Microsoft Business and Developer products, including Windows and Office products, receive a minimum of 10 years of support (5 years Mainstream Support and 5 years Extended Support), at the supported service pack level. 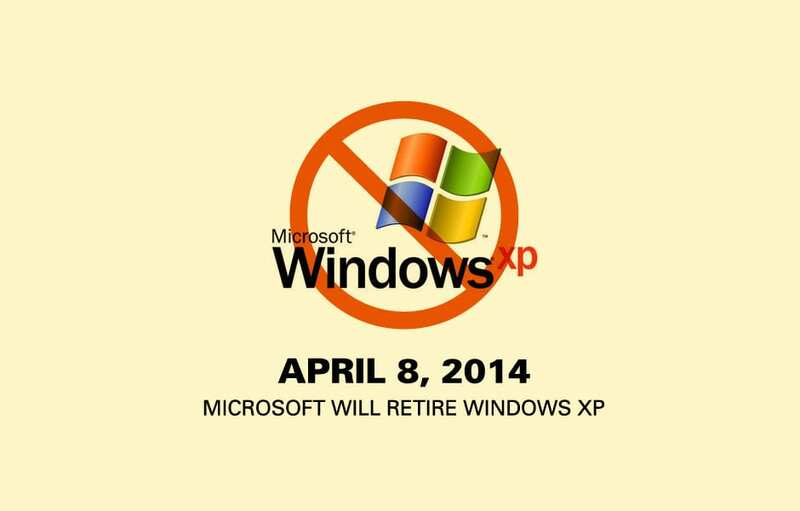 Thus, Windows XP and Office 2003 will go out of support on April 8, 2014. If your organization has not started the migration to a modern desktop, you are late and need to take action now. After April 8, 2014, there will be no new security updates, non-secure hot-fixes, free or paid assisted support options or online technical content updates. Running Windows XP and Office 2003 in your environment after their end of support date may expose your company to potential security and compliance risks. The lack of support is going to make XP users harder to defend and cyber criminals know it. Think about when Microsoft issues its first series of patches for Windows 7 and Windows 8 after XP support ends. In this situation a patch for Windows 7 could very well point criminals to the magic hole in Windows XP. This may result in an officially recognized control failure by an internal or external audit body, leading to suspension of certifications, and/or public notification of the organization’s inability to maintain its systems and customer information. Begin by contacting your VCIO or local IT provider. Understanding the best migration and deployment options available to meet your business needs can help you save on costs now and down the road. If your current PC meets the system requirements for Windows 7 or Windows 8.1, you can purchase Windows 7 Professional or Windows 8.1 Pro from a local consultant and re-seller or Microsoft Certified Partner, like IT Solutions. If your PC does not meet system requirements, consider purchasing a new business PC with Windows 8.1 Pro. Limit the use in any live environment. At this late stage it is important for your businesses to focus on measures that are within reach. In the unlikely event that you can’t upgrade your system before the expiration date, you should consider protecting your network against the high volume of security risks coming your way. Although not recommended, limiting XP user rights and locking your system down to only approved applications can be a temporary option but should only be enforced with strict security guidelines. If you plan to go this route, consider disconnecting your remaining XP workstations from the Internet. If you’re still not convinced, understand that the potential risks of a data breech at your company would be much more costly than just doing the recommended software upgrade before the deadline. If you have not started the conversation about moving away from Windows XP, now is the time to do so. The clock is ticking and there will be no last-minute extensions or alternative support options. Contact your VCIO today or call us at 1.866.Pick.ITS. In 2002 Microsoft introduced its Support Lifecycle policy based on customer feedback to have more transparency and predictability of support for Microsoft products. As per this policy, Microsoft Business and Developer products, including Windows and Office products, receive a minimum of 10 years of support (5 years Mainstream Support and 5 years Extended Support), at the supported service pack level. Thus, Windows XP and Office 2003 will go out of support on April 8, 2014. If your organization has not started the migration to a modern desktop, you are late and need to take action now.